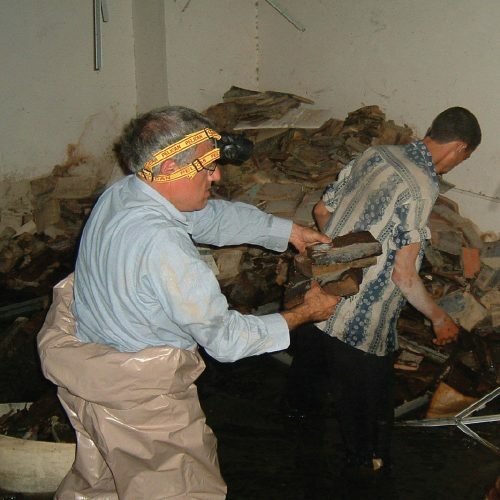 The story of the Iraqi Jewish Archives began long before US troops helped rescue historical artifacts of the Jewish community from the flooded basement of Iraq’s secret police headquarters in 2003. It started in the early 1980s, when men from the Iraqi government, carrying weapons, arrived in the middle of the night at the last functioning synagogue in Baghdad, and seized the community records stored there for safe-keeping. The upstairs, women’s section of the temple had become a repository for family as well as community records because of frequent attacks on Iraqi Jewish homes and businesses. The records included 16th-17th century antique books and Torahs, Talmudic religious writings, birth and marriage records, family Haggadahs, school reports and photographs. The government men loaded the records into trucks, refused to say where they were being taken, and drove off with them into the night. That is how a women staying in the synagogue to watch over it later described the scene to Dr. Harold Rhode. Dr. Rhode, who served for 28 years as an advisor on the Islamic world in the Office of the U.S. Secretary of Defense, was working in Iraq in 2003, and was instrumental in locating the archives and bringing them to the attention of the US government. In 2003, Rhode got a call from Iraqi opposition leader Ahmed Chelabi, who told him that a source had revealed the location of a Jewish archive held by Iraqi intelligence. The intelligence headquarters had been hit by an American bomb that did not detonate, but had gone through the building and broken the water system, finally lodging next to the Jewish archive section in the basement. The water down there was waist deep. An American ‘weapons of mass destruction team’ went in, and instead of weapons, they found evidence of the seizure from the synagogue from twenty years before: the record of Iraq’s Jewish community, who were an integral part of Iraq’s society for centuries, but had been forced from the country after the foundation of Israel. By making it impossible for Jews to work, by arrests and physical attacks on individuals, by murder and the burning of homes in mob violence, and by the seizure of all Jewish property and assets, the Iraqi government had made it plain that they wanted Jews out of Iraq. 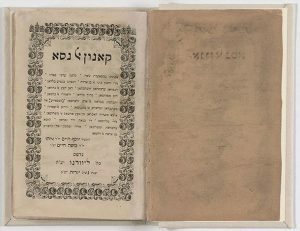 While Iraq’s Jews had been forced from the country, their personal records remained in the secret police headquarters: over 2,700 books and tens of thousands of documents in multiple languages, including Hebrew, Arabic, Judeo-Arabic and English, gathered from synagogues and Jewish organizations. One of the first items the rescuers found, slogging through the waters, was a tik cabinet holding a Torah scroll. Virtually every aspect of Jewish history in Iraq over the last 500 years was represented in the trove, including a Hebrew Bible with Commentaries from 1568; a Babylonian Talmud from 1793; a Torah scroll fragment from Genesis – one of the 48 Torah scroll fragments found; a Zohar from 1815 – a text for the mystical Jewish movement known as “Kabbalah”; an official 1918 letter to the Chief Rabbi regarding the allotment of sheep for Rosh Hashanah (the Jewish New Year); materials from Jewish schools in Baghdad, even exam grades and a letter to the College Entrance Examination Board in Princeton regarding SAT scores; a Haggadah from 1902, hand lettered and decorated by an Iraqi Jewish youth; and a lunar calendar in both Hebrew and Arabic from the Jewish year 5732 (1972-1973) – one of the last examples of Hebrew-printed items produced in Baghdad. Rhode was determined to rescue the archives and Ahmed Chelabi was ready to assist. Chelabi arranged for a truck to pump water out to only knee deep, and he found workers to help carry the books out of the basement into the sunlight. But the waterlogged books needed professional attention in order to save them; if not properly dried, some would turn to paste, and others would mold in the heat. Rhode used his contacts in the US government to alert Defense Secretary Rumsfeld and Vice President Cheney, and they raised the issue at the Security Council. 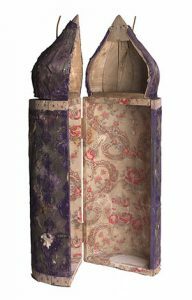 After years of careful drying, cleaning, and restoration, the collection was displayed at the National Archive in an exhibit entitled Discovery and Recovery: Preserving Iraqi Jewish Heritage in October 2013. The exhibition has since toured various museums and archives around the United States. The five-year period will soon end and the archive is scheduled to be returned to Iraq in the fall of 2018. What will happen to the Iraqi Jewish Archives now in US custody? It is possible that another temporary agreement could be made with the Iraqi government to delay the return, but that is not a permanent solution. Nor would it address the much larger question of the fate of art, artifacts, documents, and community records of Jewish and Christian minorities held by hostile governments across the Middle East. There is another, even bigger question of why the US agency that recommends international cultural policy to the President, the Bureau of Educational and Cultural Affairs at the Department of State, has chosen policies that give absolute ownership of the cultural property of religious and ethnic minority communities to the governments that have destroyed and persecuted them. The US and many other nations take the position that cultural property deemed national patrimony by a source country, is owned by that country. “Cultural property” is exceptionally broadly defined, and typically includes not only artifacts but also postage stamps, coins and currency, books, documents, manuscripts, prints, photographs, fossils, and specimens of flora and fauna. The US currently has Memoranda of Understanding with 16 countries, regarding the importation of cultural property, the most recent addition being Egypt. It can be a problem if a country’s definition of national patrimony is too broad. Many foreign nations assert that all ‘cultural property,’ from the beginning of time to the 20th century, is national patrimony. Congress established that the US would make its own decisions about the breadth of foreign nation’s cultural property claims, and balance them against the right of US citizens to access global heritage for study, preservation, and as part of the US’s multi-ethnic and diverse heritage, in the 1983 Cultural Property Implementation Act. However, the State Department has been very generous – to foreign nations – in interpreting the policy set by Congress. Despite the fact that the materials in the Iraqi archive were stolen by the Iraqi government from the Jewish community, the State Department insists that they must be returned to the Iraqi government. It makes no difference that there is no longer an Iraqi Jewish community in Iraq, or that the members of that community that emigrated to the US, Israel, or other countries, were not allowed to take their possessions with them when they left. Despite international human rights conventions that establish people’s rights to retain their personal property, it makes no difference to the State Department that the archives contain the personal belongings and family records of people forced out of the country. One way to be assured that future US import restrictions don’t leave religious relics to the mercy of hostile regimes is to adhere to a plain reading of the law, the Cultural Property Implementation Act of 1983. Under current law, the US should not restrict importation of cultural items that source countries do not themselves protect. The nation’s cultural patrimony must be in current jeopardy from the pillage of its archaeological or ethnological materials (and these pillaged items are the ones that can be restricted). The nation must have taken measures consistent with the UNESCO 1970 Convention to protect its cultural patrimony. Remedies less drastic than the proposed import restrictions are unavailable. Import restrictions are consistent with the general interest of the international community in the interchange of cultural property. These conditions do not appear to be met in current agreements with Middle Eastern nations, a situation that may be ripe for Congressional review. In earlier decades, when the Cultural Property Implementation Act (CPIA) was under the administration of USIA, from 1983-1999, agreements to restrict imports were limited in scope, and they protected narrow categories of objects that were actually at risk from archaeological looting, as the statute required. 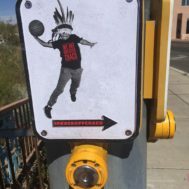 Since the Department of State has administered the CPIA and supervised the Cultural Property Advisory Committee, the agreements have covered periods from the beginning of civilization to modern times, rather than sites actually subject to current looting. Adherence to the thresholds for making the required findings have been ignored, and the lists of materials restricted from import virtually all inclusive. All requests for agreements have been granted, and renewed every five years. Some agreements have lasted more than 27 years, apparently without discernible effect in the source countries, since the problems are always said to continue. This disturbing situation exists in agreements with other countries in the Middle East, and the Department of State not only insists that this policy is absolute, it has argued before Congress in support of laws specially designed to circumvent the requirement that a functioning government exist, or that it be a signatory to the 1970 UNESCO Convention. In this way, laws have passed enabling restriction of virtually all items from Iraq and Syria. These laws recognize Iraqi and Syrian government ownership of the possessions of minority communities, both Jewish and Christian. In addition to the rights that nations have in ‘cultural property,’ there is also international recognition that no one should be arbitrarily deprived of his property, and communities have a right to own property along with others. This is considered a human right of people, of individuals, not a right of governments. Despite the egregious abuse of human rights by governments or government-supported militias in Syria, Libya, Egypt and Iraq, the State Department has encouraged making cultural property agreements with these nations. These agreements cover not only archaeological sites and monuments, but include blanket categories of all objects belonging to minorities or oppressed communities (for example, not only “all metal objects,” or “all stone objects,” but also “all Aramaic or Coptic writings,” and “all Hebrew writings”) for periods over several thousand years. In the spring of 2003, after the US invasion of Iraq, the United Nations Security Council passed Resolution 1483, calling both for lifting economic sanctions on Iraq, and for the return of cultural property illegally removed from Iraqi institutions since 1990. Immediately after passage of Resolution 1483, the US removed trade sanctions and allowed entry of Iraqi goods, but excluded cultural property from that general license. Any item imported in violation of the Act would be returned to the Government of Iraq. 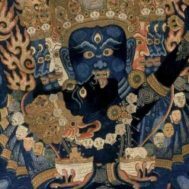 The Protect and Preserve International Cultural Property Act, H.R. 1493/S.1887, passed on May 9, 2016, required the President to use his authority under the Cultural Property Implementation Act to impose emergency import restrictions on the archaeological and ethnological material of Syria, whether or not Syria was a State Party to the 1970 UNESCO Convention. A waiver of seizure provision under Section 3(c) allows art and artifacts from Syria to be granted safe harbor in the U.S. if the owner or “lawful custodian” requests such protection or the President determines that for its preservation, the art should be temporarily located in the U.S. The art granted safe harbor must be returned to the “lawful custodian” when requested by it, and no safe harbor may be granted if the action would contribute to illegal trafficking in archeological or ethnological material, or to financing of criminal or terrorist activities. Despite the willingness of US museums to participate in safe harbor programs, artifacts have not come to the US for protective safe harbor. 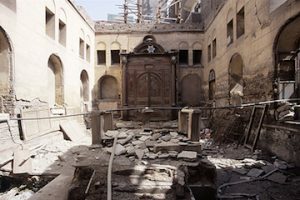 Inside of the Synagogue of Moses Maimonides before its renovation in 2010, Jewish quarter, el-Muski, Cairo, Egypt, 27 February 2006. Egypt’s cultural ministry has been vocally anti-Semitic in the past under its former head, Zahi Hawass. The tone is somewhat changed today, at least for public pronouncements. Now that there are virtually no Jews left in Egypt, the government has announced that Jewish monuments would be “registered” for the first time. Jewish monuments and former synagogues are rapidly being transformed into tourist venues, but community archives have not been made available to the former Egyptian Jewish community. Neglect is a very serious issue in Egypt. Access to Jewish records is a major concern. While the Rav Moshe Synagogue was virtually gutted prior to its recent restoration, there are thought to be thousands of books and family records still stored in other Jewish repositories in Egypt. Egyptian officials have not said what will happen to these documents, or whether they will be accessible to families or to foreign scholars. The Ben Ezra Synagogue is now a museum open to tourists. Jewish Holocaust survivors return to Libya from Camp Bergen-Belsen, 1945. The Cultural Property Advisory Committee met at the Department of State on July 19-20, 2017, to consider a request for an agreement to block all art and artifacts from Libya. The proposed embargo would include virtually all antique and ancient materials from Libya from the Paleolithic through the Ottoman Era (12,000 B.C.-1750 A.D.) and ethnological material dating from 1551 to 1911 A.D. The pending request includes the artifacts of Libyan Jews. The Jewish community is Libya is no longer in existence, the entire population having been forced to flee during the 20th century, as a result of rampant persecution, imprisonment in concentration camps in the desert, appropriation of property and possessions, the sealing up of synagogues, and the desecration of Jewish cemeteries (where bones and skulls were tossed aside in construction of malls and beach hotels). The request for a US-Libyan agreement on cultural property comes from the current Government of Libya, which holds only a portion of Libyan territory at this time. Libya is currently ruled by two competing governments and its territory is controlled by six major militia factions, and many smaller parties and entities. There is no single, effective Government of Libya that controls Libyan territory. Current US cultural property policy requires return of artifacts to the government of the originating country. This policy applies even to art that has poor prospects of surviving in conflict-ridden nations, and to art from oppressed ethnic or religious minorities that have been forced out of the source country. The results of the Libyan request are not yet known. Restrictions on imports of cultural property are not made available until the effective date and are announced through a Federal Register notice setting forth the agreement along with a Designated List of items covered by the embargo. WHY IS IRAQ SEEKING RETURN OF OBJECTS IT DID NOT VALUE OR PRESERVE? People of Jewish ancestry have lived along the banks of the Tigris and Euphrates rivers, the area now known as Iraq, for over 2,500 years. They were driven to this region first by the Assyrian conquest of Israel and later, came with Babylonian exiles. Jewish communities formed a significant, though frequently persecuted, part of the region’s economic and cultural life. In the modern era, after Iraq became an independent state in 1932, Iraq drew heavily on the skills and connections of its well-educated Jewish citizenry to develop the governmental infrastructure of the new country. Iraq’s first minister of finance, Yahezkel Sasson, was Jewish. Against a backdrop of rising Nazi fascism, Iraq turned on its Jewish officials. Jewish officials were dismissed in 1934-1936 and Jewish establishments were firebombed. In June 1941, the Farhud (Arabic for “violent dispossession”) pogrom took place in Baghdad and Basra, sparked by a successful coup by pro-Nazi officers led by Rashid Ali al-Ghailani, and resulting in the murder of 180 Jews and the wounding of hundreds more. Looting and destruction of Jewish properties was rampant. Soon after the Farhud, the British Army re-entered Baghdad, and the Jewish community in Iraq was in part integrated into Iraqi society. However, the systematic dispossession of the Jewish community began in earnest in 1947, following the partition of Palestine. After the State of Israel was established in 1948, “Zionism” became a crime in Iraq and the Jewish community was increasingly forced out of the country through a series of “confiscatory techniques” that impoverished the Jews. Jewish businesses were boycotted, Jewish individuals were charged with crimes they did not commit and then fined large sums of money. Jewish officials were fired from their jobs simply for being Jewish. Facing constant oppression and the Iraqi government’s threat to establish concentration camps for Jews in Iraq, the majority of the Iraqi Jewish population, an estimated 120,000 individuals, fled Iraq to Israel through Operation Ezra & Nehemiah. Another 20,000 individuals fled east to Iran. The 1960’s saw increasing restrictions and discrimination against the remaining Jews. Property was expropriated, bank accounts frozen, Jewish businesses forced to close, and persons of Jewish heritage were dismissed from public office. In 1968, Jewish individuals accused of being part of a spy ring were tortured and hung. In 2004 there were reported to be 35 Jews living in Iraq. In 2008 there were fewer than 10. “To suggest that the Jewish heritage of Iraq had any place at all in modern Iraqi culture seems utter nonsense. There is a peculiar revisionism among both some Arabs and Jews alike that rewrites the above history to propound a romantic syncretism, in particular the facile ‘Arab Jew’ literature from certain Israeli scholars, but again, it flies in the face of obvious facts. The reality is Iraq, through its duly constituted governments, expunged its Jews both physically and from its history. The Iraqi claim to Jewish antiquities is therefore paradoxical. Analogous, although obviously more extreme, are claims by post-Holocaust successor states to Jewish property. Conversely, Israeli claims to be the effective successor state for destroyed Jewish communities seems more a unique Westphalian gloss on the millet system or the minorities treaties. The issues are complex, but the facts are that the Iraqi Jewish Archive has been saved from utter destruction by the government of the United States, and the United States is presently a responsible steward for its preservation. If preservation of heritage is a primary goal – and few would argue with that – then the archives should remain in America, where they are safe, honored, and accessible to all. In addition, Congress should insist that federal agencies represent American interests and human interests first when making agreements on cultural property – not repressive regimes. The tragedy of the Iraq Jewish Archives should not be repeated. 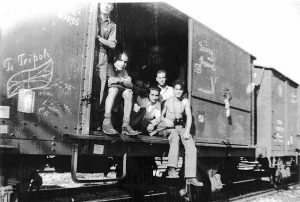 Additional Resources: The Iraq Jewish Archives, Jews Indigenous to the Middle East and North Africa, and http://www.jimena.org/resources/other-organizations/, and the Center for Babylon Jewry.